Tall, graceful, scented, and attractive; the butterfly bush is an excellent addition to most gardens. This plant adds interest to the garden in its appearance, and in the winged visitors it is bound to attract. 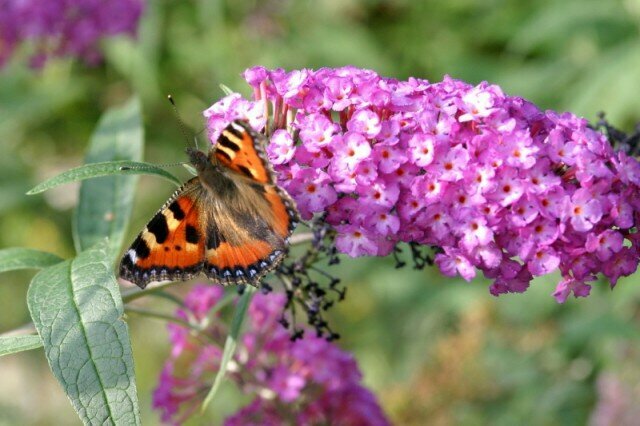 The butterfly bush is formerly known as the Buddleia, or Buddleja. The Buddleia Davidii is the most common species offered in nurseries and garden stores. 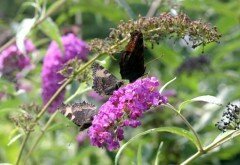 The butterfly bush has an upright growth, with long branches that are topped by graceful clusters of tiny flowers. Their flowers will lure hummingbirds and butterflies. Butterfly bushes are a hardy plant, able to survive in zone 5. They can survive winters where the temperature falls to minus 20 degrees, or grown in warmer climates where the winter temperatures rarely dip below freezing. The flowers colors may have red or blue in the name, but the flowers actually are shades of dark purple, pink, or white. Some plants, such as the Black Night Buddleia, are fast growing and will easily reach fifteen feet in height, so care should be taken in their placement. Others, such as the Royal Red, are much shorter and will o­nly grow to about six feet. Due to their height and quick growth rates, Butterfly plants are great selections for planting next to houses, along fences where privacy is desired, or at the back of a garden where they can provide additional interest. They can also be grown in pots o­n a patio for strategic areas of shade. These bushes thrive in full sunlight, and while they do require watering in the summer they are not overly sensitive. They are quite hardy. While they will grow in most soils, they do require the soil to be well-drained. Pruning is recommended as the plants do not shed the dead flowers. Spent plumes of flowers can be lopped off either just below the flower head, or if you are looking for a neater look you can go down to the main stem. Anyone wanting a taller, flowering bush to adorn their garden, or a plant that will attract winged visitors, is sure to be pleased with the Butterfly Bush.